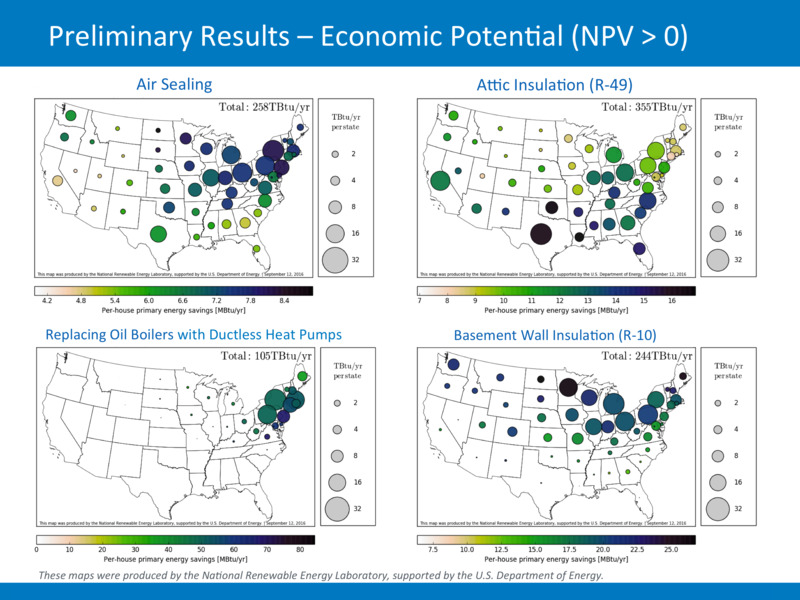 The result: a predictive model of energy savings and return on investment ratios tailored to individual homes that considers location (there are 216 climate locations), fuel type (i.e., electric, gas or oil heat), envelope and building component characteristics (windows, insulation levels, HVAC systems) and local energy costs. Results include the characteristics and consumption of baseline homes. Also, results for various efficiency upgrades include the aggregated technical potential – the theoretical energy savings potential using available technology, or economic potential – the savings potential remaining after filtering by cost-effectiveness (for example, net present value of >$0, or a simple payback period of <5 years). Energy upgrade packages are applied for enclosure, HVAC, water heating, lights, and appliances (in combination or alone), and the results analyzed for cost effectiveness. These results can be “sliced and diced” to a level of detail that gives, for example, the percentage of the number of homes in a location of a certain size and vintage that would benefit from a certain upgrade. The data give utility program managers and regulators the ability to dive deep into the savings and cost-effectiveness of measures. We are looking forward to learning more about the ramifications of this new modeling tool. –(Updated 3/21/17): See a publication documenting the ResStock analysis conducted in support of the U.S. Department of Energy’s Quadrennial Energy Review 1.2 & Home Improvement Catalyst (Electric End-Use Energy Efficiency Potential in the U.S. Single-Family Housing Stock, authored by NREL’s Eric Wilson, Craig Christensen, Scott Horowitz, Joseph Robertson, and Jeff Maguire).